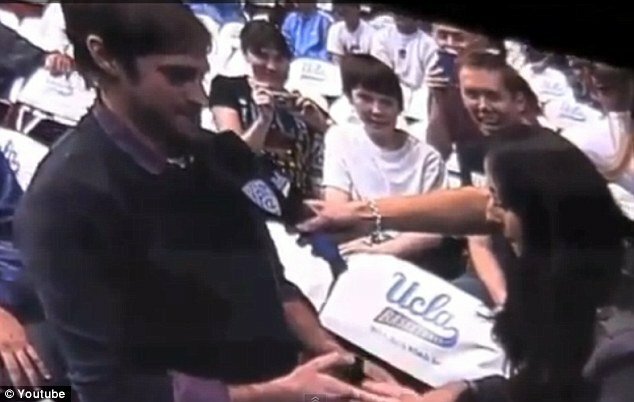 A young basketball fan at a college game in Los Angeles has been embarrassingly refused by his girlfriend when he made proposal in front of a stadium of booing spectators. The pair was captured on the stadium camera during the half-time entertainment during a game between UCLA and Richmond on December 23. The crowd watched the scene unfold as the young man knelt down to ask for his girlfriend’s hand. But as the young man stood up and the UCLA host came over to offer him the microphone, her smile turned into a look of mild confusion and surprise. When he opened the box to present the ring, the young woman’s attitude appeared to change. Offering words of consolation the host said: “Sometimes we get a little camera shy,” but the rejected lover departed shortly after with his head hanging low in shame. 50 Cent macabre death prediction on Twitter: "I don't think I'm gonna live much longer."